The last few years have been life-changing for New Jersey singer-songwriter Jack Antonoff. Once the leader of cult favorite indie rock band Steel Train, Antonoff rocketed into the pop stratosphere as a member of the Grammy-winning group fun., and is now co-writing hits with Sara Bareilles and Taylor Swift. 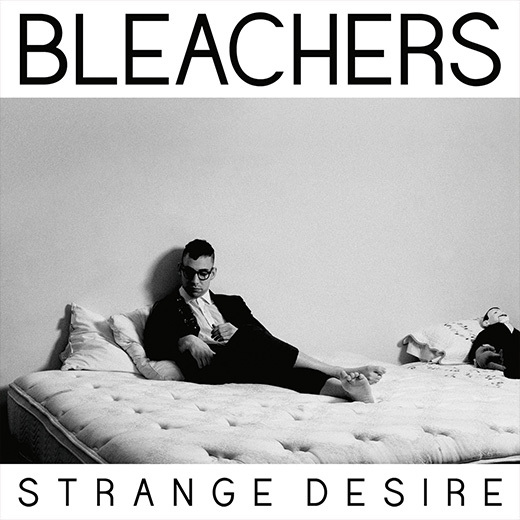 This week saw the release of the debut album from his new project Bleachers, Strange Desire, which carries over many of the themes that made his previous work so memorable while delivering a unique sound of its own. Jack Antonoff is an impressive pop songwriter, able to craft habit-forming hooks around genuine, deeply personal lyrics. He first claimed a spot on my list of my favorite living songwriters with “Bullet,” the opening track of Steel Train‘s self-titled sophomore album, a song which I consider to be the first and only worthy successor to Jersey Youth Anthems “Thunder Road” and “Born to Run.” (And you’re talking to a pretty serious Bruce guy here.) Antonoff is a very New Jersey songwriter in that his songs often dip into themes of youth (and the fear of losing it) and the romanticization of late night highway drives. Antonoff manages to connect with listeners without ever pandering. He’s telling his own story, which more likely than not has very little in common with yours, but the sincerity of his feelings helps you to find something in your own life that vibrates at the same frequency. Bleachers’ lead-off single “I Wanna Get Better” is clearly about Antonoff dealing with his own fears, his own weaknesses, and his continuing struggle with his sister’s untimely death, but it carries the broader theme of self-improvement, of defeating regret and chasing greatness. 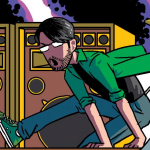 It’s a spiritual successor to “Bullet,” the continuing story of someone who won’t ever forget what’s come before and isn’t trying to–he’s trying to build on it. Lyrically, Strange Desire is very much a full-length expansion of these themes, but musically “I Wanna Get Better” is totally out of place on the album. Where “I Wanna Get Better” is upbeat and sparsely produced, the rest of Strange Desire is moody, cool, and built almost entirely on top of a heavy layer of Twin Peaks synthesizer. It’s a pop album for sure, but it’s less punchy and more atmospheric. For much of the record, Antonoff forgoes radio-friendly tenor or punk-inspired shout-singing in favor of a smooth, reverb-soaked baritone. It still works, but it’s far from what the lead single would imply. My first close listen to Strange Desire was during a nighttime drive on the Turnpike in the middle of a torrential downpour, and I think that may be the best way to enjoy the album. There’s a “pea soup” quality to much of the album, a thickness to the synths and the vocals that feels like rain. The emotions on the record are also pretty heavy, and a good rainstorm is a great visual/physical cue for both tears and cleansing rebirth. “I Wanna Get Better” is an anomaly on the album, but the follow-up single “Shadow” is a fair representation of what a single off of this album ought to sound like. It’s an upbeat, catchy song that still carries the same production and atmosphere of the rest of the album. It’s not nearly as strong of a track as “I Wanna Get Better,” lacking its strong lyrical narrative and triumphant feeling of summer, but it’s striking and memorable. These album-oriented tracks are actually more compelling at points than the more radio-targeted tracks, like the singles “Shadow” or “Rollercoaster,” whose lyrics feel a little juvenile for the seasoned thirty-year-old songwriter. I have little doubt that these songs come from a personal place for Antonoff, but his lyrics are most affecting when he’s talking to himself, not to us. The weakest link of the album, “Wake Me,” is a love song with junior high-quality lyrics (“I’d rather be sad with you than be anywhere away from you”), though they’re still redeemable due to the singer’s reputation for honesty. The single that plays best on the album’s sonic and lyrical strengths is “Like a River Runs,” Jack’s driving, anthemic tribute to lost sister. “I will remember your life,” promises Antonoff, in a chorus that would be corny if not delivered so sincerely. The ghost of Sarah Antonoff has been present since Side 1, Track 1 of the first Steel Train record, but this is the biggest, most overt reference to the hole her absence has left in Jack’s life, and his commitment to honoring her while still living his life. There’s a clip heard at the beginning and end of the album that delivers the thesis statement for the album. “I really want to be grateful for the experience I’ve had,” says the voice, and so does Jack. Strange Desire is about healing and redemption, about love and family. Jack Antonoff is sharing his pain, for the sake of his own personal growth, and ultimately, for our own. UPDATED 8/19/14: Originally stated that the voice clip at the beginning and end of the album was Sarah Antonoff’s voice, but it has since been clarified to be the voice of Lena Dunham’s younger sister talking about graduating college. Strange Desire is available now at your local record store, or online. Where did you hear that “I really want to be grateful for the experience I’ve had” clip is Sarah’s voice? I thought it was Lena Dunham’s sister Grace talking about college. I was under the impression that this was the looped recording of Sarah mentioned in the Vulture article I linked to. Is that incorrect? The article says his sister’s voicemail is sampled but doesn’t specify which sister or which sample. Grace is credited in the liner notes for spoken word though and I recall an interview where Jack said a recording of her talking about college made it onto the album.